The Events Panel is where you define the sorts of events for whch schedules are required. SmartRoster uses the term Event to mean a series of meetings (for a Church, this could be Mass or a Worship Service) with the same role requirements (the same roles and the same number of people required for those roles). An Event is defined as occurring on arbitrary dates and/or according to a regular pattern of dates. For example, Sunday 10AM Service may be an event that occurs every Sunday and needs a Speaker, Leader, 2xSingers, Organist and 2xUshers. A single Event can have one or more regular repeating patterns, and one or more adhoc dates. Patterns and adhoc dates can also be excluded from the event definition (all EXCEPT the date or pattern). SmartRoster gives considerable flexibility in how you define your events. Event Roles - An event is defined as a repeating sequence of meetings that have the same Role requirements. These role requirements are defined by clicking the Roles button (or by adding Events into the "Applies to Event" box in the main Roles panel). You can easily find an entity by typing into the "Find" box any part of a person's name or email address. The Roles Panel - is where you define the roles (a.k.a. skill, job, duty, ministry). Roles correspond to specific skill sets to which individuals are allocated. You can drag-and-drop names from the People panel into the Role Members list. Role information is organised under three tab pages, General, Members, and Notes. For each role a separate schedule will be added to the Schedules panel (as long as Include on Roster is ticked). Compatible Roles. For the purposes of the automatic scheduler, roles can be made compatible. By default roles are incompatible. The same person cannot be allocated to two incompatible roles on the same event date/time. By making roles compatible you can allow for people to be scheduled to multiple roles on the same event. You can even set the degree of compatibility - so that the automatic scheduler will activitely try to put the same individual into multiple roles, or require them to be on most roles where they are available for both roles. Applies to Events... By default, all roles are required by all events (services/meetings). The "Appies to Events" list is used to restrict the events for which a role is required. For each event you can define how many of each kind of role is needed (or for all) and how many times/days/weeks/months consecutively to roster the same person for this role, for this event. Schedule this role allows you to temporarily prevent or allow a specific role from being included in the current master schedule. You add role members into the Members tab of the Roles panel. They can be activated or inactivated via the asterix column. If inactive, the automatic scheduler will ignore them when building the schedule for that role. The various role member parameters, such as Event, Fixed usage, whether they are spare or trainees, and enforced break, can be edited by double-clicking on a role-member. A role member can be scheduled manually or by the automatic scheduler. Once you have set up your people (individuals, households, groups), roles, and events, you can start constructing your schedule. SmartRoster makes this easy, but even more important, it can automatically do most of the work for you. The Automatic Scheduler is SmartRoster's most powerful feature, the one that really sets it apart from the competition. The first step in creating schedules is to set the time period to be covered by the schedules. There is no limit as to the size of the duration you can set - a day, a few months, ... a year - SmartRoster doesn't care! You can manually assign people to the schedules by drag-and-dropping them from the Role Members list or from the People panel. 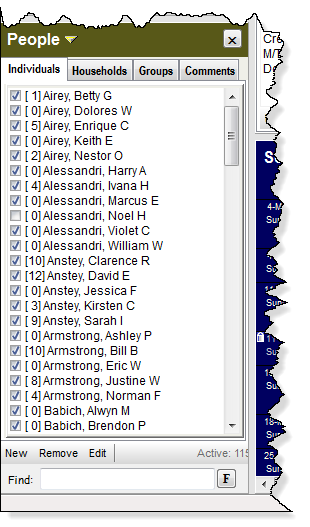 Alternatively right-mouse-click over a cell to get a list of people available in that timeslot. Do this before running the automatic scheduler when you want to fix a person to a schedule position, thus preventing the automatic scheduler from assigning that position. You can also just to drag and drop names from one cell to another - just like a spreadsheet! Hold down the control key while drag-and-dropping to copy the name. Also, just move the mouse cursor over a name, and SmartRoster will highlight that name every where it appears in the schedule! If a name appear in red you can hover over the name to see which rule has been broken. You may manually allocate some or all events for a role (such as the Speaker role for a Church Service, which would rarely be automatically allocated) and you may even allocate all roles for some events (like a special memorial service or holiday). SmartRoster allows you to lock in a whole row, column, or cell at a time, or name in a cell. Auto Fill will not re-allocate cells that are locked. To automatically assign people to all of your schedules, select Auto Fill from the Schedules menu. 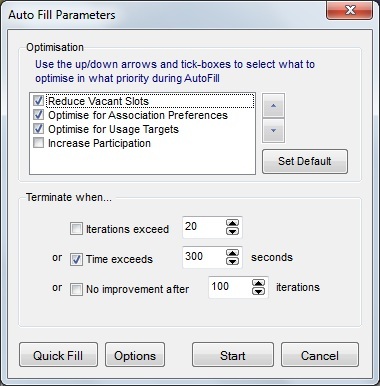 In the Auto Fill Options dialog box you can set the Auto Fill priorities (what to optimise) and end point (when to stop). The Automatic Scheduler will then start generating great, non-conflicting schedules. It will keep trying to improve the schedule untill the end point is reached. You can stop it at any time and make any minor adjustments and changes you want, including locking down part of the schedule and restarting the scheduler. For instance you may like the result for a role or roles. Just lock those roles and re-schedule to improved the remaining schedules. The Automatic Scheduler will assign all time slots not already assigned and locked in. It will attempt to satisfy as many preferences as possible while also meeting usage targets and filling vacancies (how many required in each role/event combination). The most important report generated by SmartRoster is the Master Schedule (see below). This is the report you will probably want to hand out to your people. SmartRoster also generates Address Book reports that you can use in your organization, and has many other reports, such as address labels, reminder labels, Role-member lists (sometimes called Rosters), Role and event distribution, Attendance, absences, and Personnel inventory. This report shows the master schedule for one household with personalized shading of each person in that household. You can also generate a personalized report which only has the specific roles a person is serving in. Another useful report is the Event report which shows each event occurrence (eg each service) on a single page with all roles required and the names of those serving in those roles. The SmartRoster Viewer allows you to preview and print reports. You can also save reports as pdf (Adobe acrobat) format for easy electronic transmission or printing. 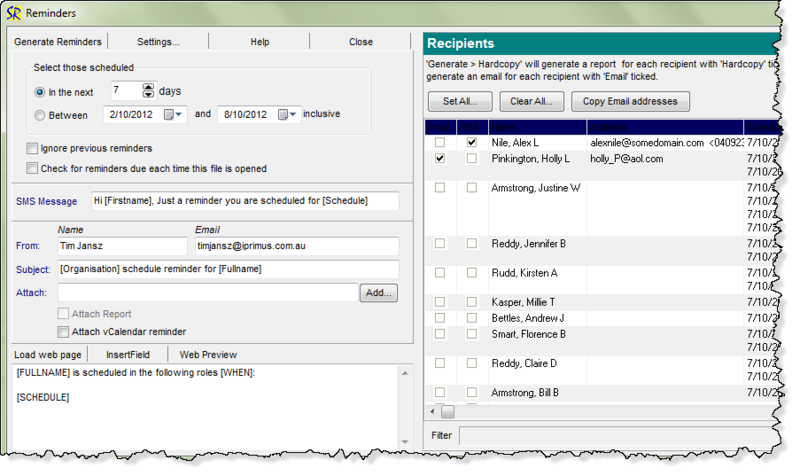 You can also export a schedule directly into MS Word®, which allows you to then edit the report before printing it if you have this available on the PC running Smartroster..
SmartRoster provides as a core feature the ability to email reports, reminders, and arbitrary messages and file attachments to individuals and households. You can send a report directly from the SmartRoster viewer simpy by clicking the email button. This permits choice of recipient, and an optional text message, plus other document attachments. You may easily send bulk adhoc email which include your own message and attachments to a list you select from individuals, households or groups in your SmartRoster file. This list can be saved with a name for easy reuse. You can also select specific roles when selecting recipients, which allows you to send a message only to people in specific roles. SmartRoster is able to automatically or manually (when you choose) send reminders to those people who have an email address. Choose the number of days to look ahead when determining who to remind. The list will automatically show with those due in that many days from now. Click Generate to start generate the actual email messages. These are queued in the Email queue for sending. If you have AutoSend ticked then they will also be sent. If not you can review the messages - and even change them - before sending. Eg. for David Anstey, the above substitutes as follows: "David Anstey is scheduled in the following roles in the next 7 days: Sunday AM/7-Oct-12/Song leader"
By ticking the "Check for reminders.." box, SmartRoster will check for any reminders that are due in the number of days specified each time you open this SmartRoster file. If reminders are due then the Reminders dialog will display for your review and action. If you have SMS (texting) enabled (this is an purchase option) then you can set the text message which also permits field codes as for normal email messages. You can select for each individial whether they will receive reminder via email, SMS text or both..
"I was absolutely thrilled with your program. A lot of good sense has gone into SmartRoster! I was especially impressed by the fact that the program generates a large number of schedules in an effort to come up with the best possible one. Incredible! (But that's what computers are good at, yes?) Thanks again for a great program, a great price, and for excellent customer service. I hope you prosper in selling your program, and that it becomes very popular. I don't see why it wouldn't. It is serving our purposes extremely well, and I will be looking to recommend it to anyone who could use it."